It is one of the most controversial artifacts discovered in recent years. The Sealand Skull has raised numerous questions that science cannot find an answer to. Strangely, few researchers have shown interest in analyzing the mysterious artifact, perhaps because they are afraid what they might find out, something that could change the way we look at human origins and our entire history. The Sealand skull was discovered in 2007 in Olstykke, Denmark by workers who were replacing sewer pipes. Until recently, nobody seemed interested in this finding. It was in 2010 that the skull was first examined at the College of Veterinary Medicine in Denmark. The researchers concluded that they were not able to solve the mystery nor provide anything that would explain to what species it belonged to. “Although it resembles a mammal, certain characteristics make it impossible to fit into the Linnaean Taxonomy” scientists said. At first it was assumed that the skull belonged to a horse, but further examination revealed that was not the case. Since researchers were unable to provide further details and the question regarding the Sealand Skull were many, the skull was sent to the Niels Bohr Institute in Copenhagen. Carbon dating revealed that this mysterious being lived between 1200 and 1280 BC. Later excavations at the site where the Sealand skull was discovered, showed nothing of interest as researchers were unable to find anything that connected the Sealand Skull to other objects from the area. 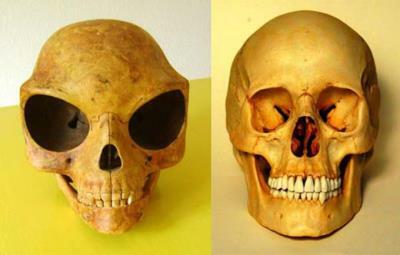 When compared to a normal human skull, the Sealand skull has several differences. For example, the eye sockets of the skull of Sealand are not only quite large, but are also much deeper and more rounded. The eyes sockets of the Sealand skull seem to extend further to the sides whereas in a human skull eyes are more centered. The nostril of the Sealand skull is very small and the chin is very narrow. 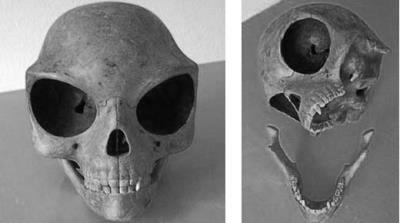 The Sealand skull is larger than the size of a male Homo Sapiens. The eye sockets are very large, and the smooth surface seems to indicate that this being was adapted to colder weather. The relative eye size suggests it was a nocturnal creature with giant eyes. There are numerous mysteries surrounding the Sealand Skull and the region where it was discovered. It is interesting to note that residents in Olstykke and nearby villages, since ancient times, have talked about a local group called l’Ordre Lux Pegasus (the Pegasus Order of Light), whose true purpose is a mystery, the Orders mission is believed to be that of protecting various elements – among them a mysterious cranium and several devices made of extremely lightweight and unbreakable metals. The images are really interesting and prove just how unusual the skull of Sealand really is. Even though the skull is similar to that of a human, there are still several differences that make it very unique. More researches are leading towards the possibility that the Sealenad skull belonged to an extraterrestrial being that lived on Earth. Other researchers suggest that it belonged to a lost and forgotten species of ancient humans, who were very different when compared to modern humans. Researchers have very limited knowledge about our past, and with discoveries like this, the past is blurred, more than ever.